6 x fake succulent plant pick. Green,light green,Flocked Green,Frosted Green,Dark green. plastic with flocking coating or Soft Latex. The middle left succulent is Soft Latex echeveria. it is about 4.3" Wide x 3.54" Tall. The Lower left succulent is artficial cactus in Frosted Green. it is about 3.54" Wide x 4.3" Tall. The upper middle succulent is Artificial Hops with flocking coating.it is about 4.5" Wide x 6.7" Tall. The lower middle succulent is Fake Textured Aloe,it is about 3.93" Wide x 5.1" Tall. The lower right succulent is artificial hanging string of pearls plant .it is about 14.4" Length. These faux succulents are look realistic and come in a variety of green hues, types, and sizes.They also give the feeling of either a cacti or tropical feel. If you don't want to deal with having to care for real ones these are perfect for you. They can used as a gift for your friends,teachers, cowokers, lovers and family members. Use it to decorate a wreath, a planter, a terrarium, or simply use in individual decorative mini pots. It is great for wedding bouquet, party , office decoration ,decor, altar, church ,corsages, pew bows, reception centerpieces.Get creative with our faux succulents! Package included: 6 x fake succulent plant pick. Color:Green,light green,Flocked Green,Frosted Green,Dark green. Material:plastic with flocking coating or Soft Latex. Size:about 3.3"- 6.7" in Width. about 3.5" -14.4" in Length. 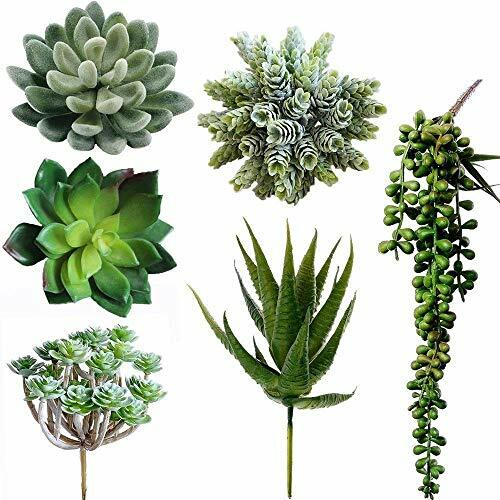 These faux succulents are look realistic and come in a variety of green hues, types, and sizes.They also give the feeling of either a cacti or tropical feel.They can used as a gift for your friends,teachers, cowokers, lovers and family members. If you don't want to deal with having to care for real ones these are perfect for you. Use it to decorate a wreath, a planter, a terrarium, or simply use in individual decorative mini pots.Bring modern flair combined with garden charm into your house. It is great for wedding bouquet, party , office decoration ,decor, altar, church ,corsages, pew bows, reception centerpieces.Get creative with our faux succulents!